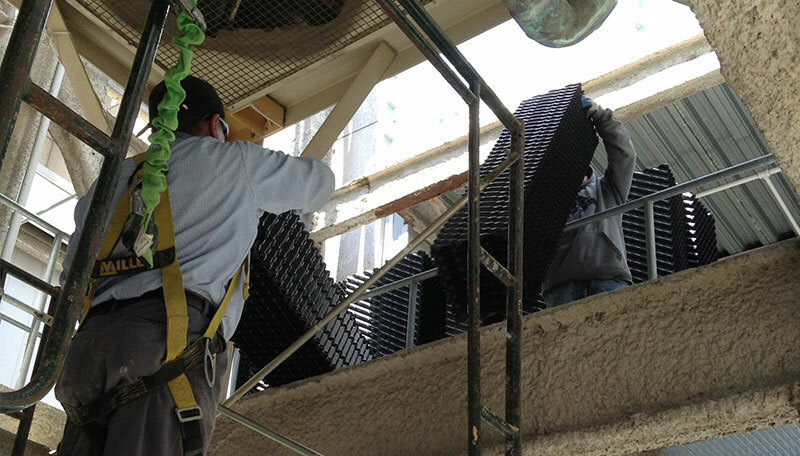 The WSC Tower Fill System includes built-inair intake louvers, surface fill and drift eliminators. Our packing bundles will increase heat transfer efficiency of cooling tower, and extend the tower’s economic life. The PVC compounds used in fill bundles have outstanding resistance to weather exposure and are nearly impervious to chemical degradation by alkali, acids, grease, fats, oils and biological attacks. PVC also has an excellent fire rating due to its self-extinguishing characteristics and meets or exceeds Cooling Technologies Institute PVC Materials Standards 136. WSC standard film fill bundles are a PVC .010″ cross-corrugated, edge bonded fill with optimally sized microstructure, dedicated glue points, high surface to volume ratio (48 sq. ft. per cu. ft.) and high thermal performance. This fill is designed for either crossflow or counterflow towers. A .015 film fill is available, along with a 68 sq. ft. per cu. ft. surface area for special applications. 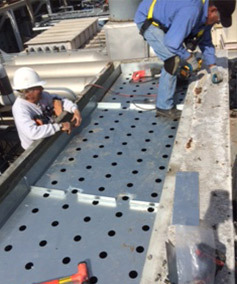 The fill system includes a supports deck designed to keep packing material above the wet deck. This allows the hot water to flow downward more freely through the fill media carrying solids across the wet deck and into the sump. 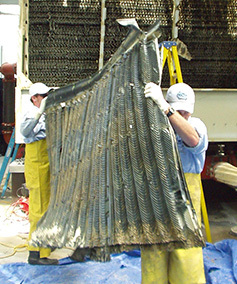 This raised area (approximately 3 to 4 inches) allows water and chemicals to flow underneath the fill bundles during daily operation, as well as during periodic cleaning. Cross flow cooling towers utilize gravity distribution basins to distribute the returned hot water. Gravity systems are mounted on top of the tower directly over the fill media. Spray nozzles placed in the hot water basin to distribute returned water evenly over the surface fill. Constant movement of returned hot water eventually will cause the pan to fail. Rust holes in the sidewalls and basin floors cause the return water to be redirected away from the surface fill. Splash outs, hot spots in the fill media and excessive water drawn into the fan plenum all reduce the tower’s cooling ability. Valuable resources of water and electricity are wasted until a replacement pan is installed. 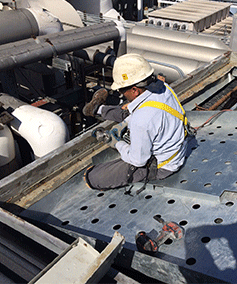 Call WSC today to see if we can contain some cooling tower budget leaks for your company.